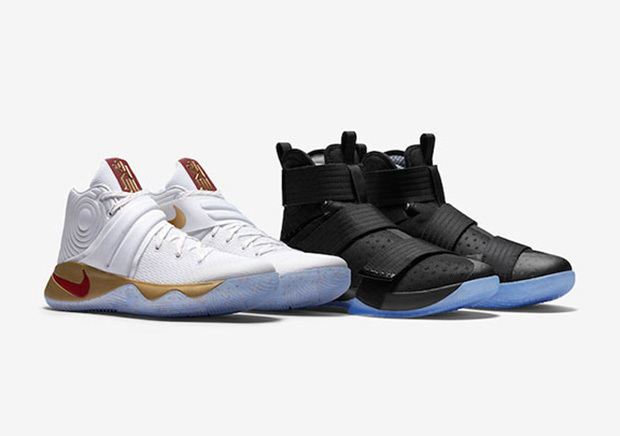 Update: November 11th, 2016 at 12:45PM: The entire Nike Basketball “Four Wins” Pack Games 3, 5, 6, and 7 are available today exclusively at Foot Locker’s 34th Street Flagship Location. The LeBron-Love-Kyrie partnership has never been stronger following the Cavaliers’ NBA championship this past June. It took contributions from all three players – LeBron’s career-defining block, Kyrie’s cold-blooded game-winning three, and Kevin Love’s defensive stopping of Steph Curry to win it all. 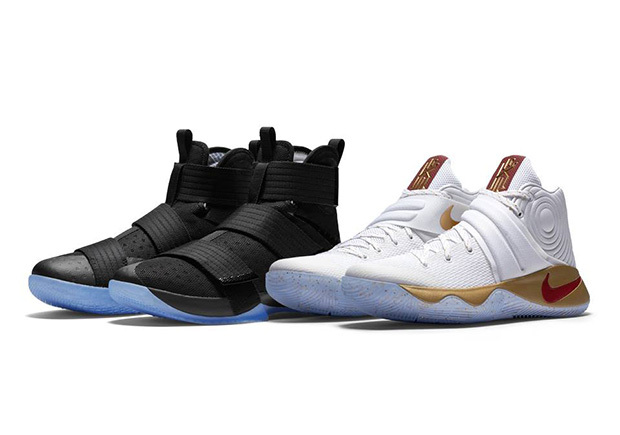 Nike Basketball celebrated with the LeBron and Kyrie “Four Wins” Pack featuring four different combinations of the Kyrie 2 and LeBron Soldier 10 PEs that the two Swoosh stars laced up in each victory. Now we have some good news: The 4 Wins Pack Game 3 “Homecoming” selection just restocked today at Foot Locker’s 34th street location. The Nike Basketball 4 Wins Pack “Game 3” honors the Cavaliers’ first win of the NBA Finals with a clean Kyrie 2 offering featuring a “Home” inclined white upper, head-turning metallic gold midsole, and contrasting elements of a Cavs’ themed wine Swoosh and icy bottom. The LeBron Soldier 10 utilizes the signature all black upper (whether this was inspired by LBJ’s love of the Undertaker remains to be seen) while an icy bottom keeps things in line with the Kyrie offering. Are you excited about your chance to grab the first offering from the Nike Basketball 4 Wins Pack? Check out more shots below and stay tuned for more release date updates right here on Sneaker News.